Did you know that even the youngest children are affected by stress? Both positive and negative changes in a child’s life create stress. Events that interrupt a child’s routine such as a new baby, moving to a new community, a new job with new schedule, job loss, financial strains, witnessing domestic violence, homelessness, coping with disabilities or developmental delays all create stress in a child’s life. Children do not always have the words to tell you how to support them. 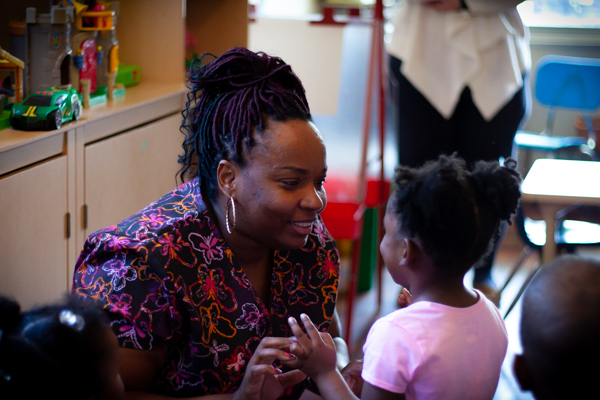 As a child care provider you can help children by keeping a regular daily routine, introducing calming activities, listening, and providing resources for families. 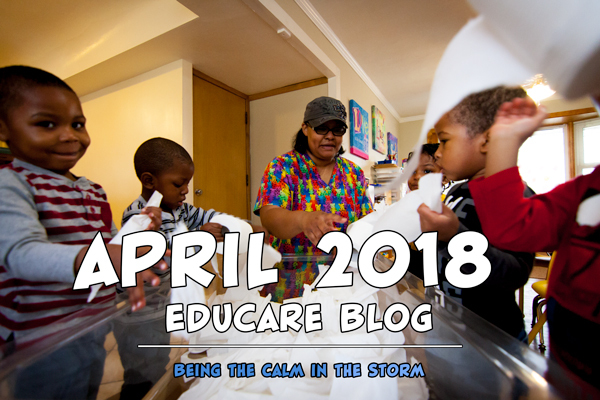 April is National Child Abuse and Prevention month and so this month ARCHS’ STL Educare program highlights providers working to be the calm in the storm for children facing difficulties. Many of our Four or Less Registered home child care providers care for grandchildren. As one of our grandmother/caregivers was beginning the process for renewing her vendor license, she suddenly found herself the haven for her six grandchildren who had suddenly become homeless. The provider knew she could count on ARCHS’ STL Educare Specialist, Amy Flesher, to help her schedule and complete the state required trainings. She had called for assistance in finding the provider health check form, securing safety items, and reviewing the emergency preparedness plan to prepare for the upcoming on-site monitoring visit. But, thanks to a recent training of Educare staff about supporting children experiencing homelessness, Amy was also able to recognize that the children were homeless and help this caregiver identify the Saint Louis Public School McKinney-Vento liaison to make sure the grandchildren, who were enrolled in school, did not have to change schools during their transition, and that the school social worker and councilor were aware of the children’s situation. Each school district in Missouri has a designated McKinney-Vento liaison. See the link below to find yours. Our April activities highlight two providers from north St. Louis county, and one from the Southwest Garden neighborhood in St. Louis City. Check out these low-cost, calming activities St. Louis area providers are using to support children who are experiencing stressful transitions in their life. 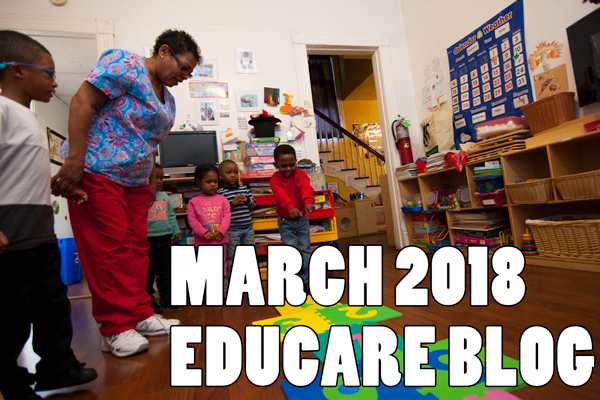 Don’t forget to tune in next month when we highlight another of our STL Educare providers as they build positive relationships that help to prevent bullying and pre-school expulsion in the classroom. Becky Bailey’s “I Love You Rituals”: The key to using the I love you rituals is in creating a connection with the child through eye contact, touching hands, and repeating nursery rhymes or poems that become familiar to the child and can be used during stressful situations to recreate that connection and help the child calm. You can add lavender lotion and massage into the hands and wrists while reciting the poem or rhyme if the child is comfortable with lotion. Becky Bailey’s Breathing Techniques: Conscious Discipline teaches children six different breathing techniques they can use when they are scared, or overwhelmed to self-calm. In Becky Bailey’s “I can Calm” book she has pictures to help children remember breathing techniques like STAR “Stop. Take a deep Breath. And. Relax,” The Pretzel, and Bunny Breathing. Children can use pictures to go through all six techniques or go to their favorite. Teachers are encouraged to incorporate at least one breathing exercise into their daily routine so children are familiar with them when they need them to self-calm. Creating a Cozy Area/Safe Place: Just like adults children sometimes need to get away from the bustle of the day and sometimes feel overwhelmed by what is going on in the classroom or in their life. Having a cozy space that only 1 or 2 children can go at a time gives children the opportunity to self-regulate, to think, and work things out. The place should be out of the hustle and bustle of the classroom, large enough for the child and a friend or adult to talk, and comfortable. You can add items such as the breathing techniques and other items to help children work through what they are feeling or to destress. Rain Stick: Make your own rain stick using a mail tube, paper towel roll or other sturdy round object. Push or hammer in nails, pins, or golf tees. Cover the outside with fabric, contact paper or construction paper and stickers. Fill with rocks, beads, rice, or other small object that can pass through the nails or pins. To create a calming effect, children should turn their rain stick gently from side to side listening to the objects as they cascade through the stick. Kids Yoga: Kids Yoga can be both fun and relaxing with yoga cards that focus on animal poses or free YouTube resources that Cosmic Kids Yoga that take fun popular culture themes such as Star Wars, Trolls, and Frozen to introduce yoga poses as they sequence through a story with familiar characters. Music & Movement: Music has long been recognized as a way to enhance and change our moods. Try finding music pieces that let kids act out feelings. Sad, angry, happy, excited. How many emotions can you find a song for? 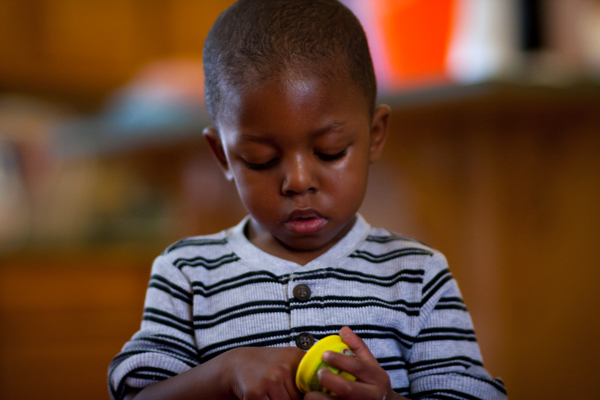 Healing Playdough: Kneading, rolling, poking, and punching a big pile of playdough can work wonders for easing stress for children and adults alike. Customize your playdough by adding these essential oils to create different types of healing doughs. Always check for allergies before using any ingredients. Sensory Play: Sensory play has many benefits from language development as child care providers help to give children the vocabulary to describe their world to helping children calm by giving them a sensory experience to focus on. Sensory play does not have to involve expensive materials and equipment. Water play can use warm or cool water paired with common items found in the kitchen or from the child’s play area. Do you have dishes, plastic dolls, or cars you can wash in warm sudsy water? Getting outside as the weather turns warmer to make mudpies, plant a garden, or dig in the ground can have calming benefits. Having kids squeeze, sift, and feel a variety of different textured items in a sensory bin or box can be done inside or outside. 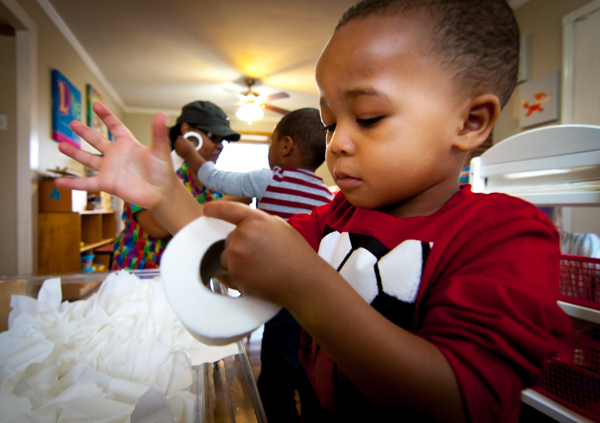 For those children or providers who do not want the mess try using unmatched socks and filling them with different ingredients that children can squeeze and move through the length of the socks during stressful situations. Spring is so close you can taste it! March 20th marks the first official day of spring and with bitterly cold days of winter almost at an end here are some activities to clear away the winter cobwebs. Taking 30 minutes out of the day each morning and afternoon to encourage children to engage in physical activities can help your little ones burn off energy, provide opportunities for hands-on learning, and has been shown to have positive effects on physical and emotional well-being. 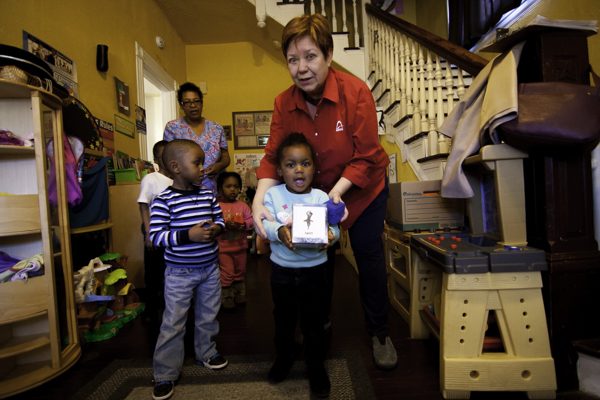 This month ARCHS’ STL Educare program salutes Kim Clay, Owner/Director of the Licensed In-home child care program Auntie’s House. Kim has provided day and evening care in a safe family environment in the Walnut Park West neighborhood for over 20 years. Check out the fun, low-cost learning activities the children at Auntie’s house are doing and don’t forget to tune in next month when we highlight another of our STL Educare providers as they access St. Louis area resources that support kids in crisis and explore activities that can reduce the effects of trauma and stress. 1. Music Movement Activities: One of the cheapest, easiest ways to get children moving is by using familiar songs such as “Head, Shoulders, Knees, and Toes,” or “Itsy Bitsy Spider.” For an added twist try varying the speed/pitch of the song. Can you sing low and slow or high and fast? How does that change the way the kids move their bodies? Have you ever tried having the kids dance to “In the Hall of the Mountain King” by Edvard Grieg? 2. 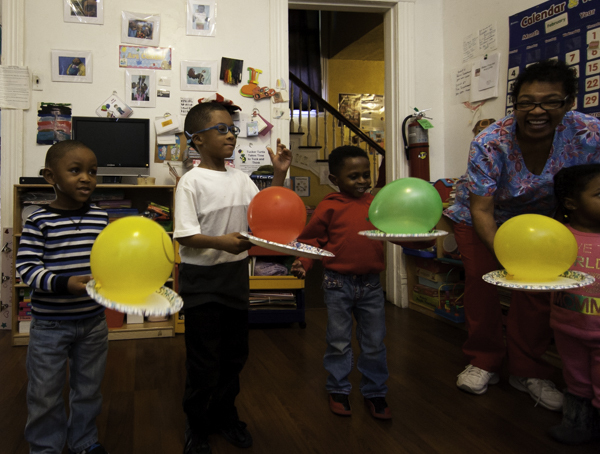 March Winds: Ball up a piece of paper, cotton ball, balloon, small ball, or feather. Each child should try moving the ball from one place to another by blowing the ball. You can have them blow directly or try using a straw to increase the pressure of the air to see if the ball moves further/faster. Do the objects move quicker when you add more children/wind power? Which object was easiest to move? Which was hardest? Try graphing your results. 3. Indoor Obstacle Course: Use a ball of twine, yarn, or tape to create a path that winds under tables, around furniture, over pillows to help children learn positional words while they burn off energy on a cold or rainy day. 4. Don’t Let the Balloon Touch the Ground: Attach Popsicle sticks to paper plates for a new twist to keeping your balloon from touching the ground. Have the kids come up with a story about a hero (balloon) they are trying to save from the dinosaurs, hot lava, or spikes that are on the ground trying to get your hero. Can you save your hero from all the obstacles that are working to get her? 5. Jump, Twirl and Hop: Practice counting while getting the wiggles out with this fast favorite. Have the children create counting stations by placing a toy or piece of paper on the floor with a number for how many times they will jump like a frog, hop like a bunny, twirl in circle. The limit for what you can do is your imagination. 6. Recycling Bowling: Make use of your water bottles, empty cans, and other recycled items by setting up an indoor Recycle Bowling alley. Have your children decide how much it costs to play and what they can use to knock down the cans and bottles. Will the soccer ball work better than a tennis ball? Can you use a balloon? Write down what works and doesn’t work. Why do you think one object works better than another? Equipment Needed: Recycled items that have been cleaned, balls or other objects from around the house. 7. Hopscotch: Don’t have a hopscotch mat? Make your own using paint, crayons, or chalk. Toss a stone or roll a dice to see how far you will jump. Can you make it to the number and back hopping on one foot without falling down? 8. Sock/Bean Bag Toss: Use bean bags or ball up a pair of miss-matched socks. Can you toss them into an open laundry basket, into a shoe box, or onto a pillow? How many times can you hit your target? Who tosses their bag or ball the furthest?